Pangboche Crater is a very fresh, 11 kilometer (6.8 mile) diameter crater near the summit of Olympus Mons, a large shield volcano that extends 500 km (310 miles) in diameter. Geologically young craters are important to investigate the current cratering rate on Mars. There are multiple lines of evidence that indicate that Pangboche is geologically young. Pangboche has a very distinct, sharp rim. 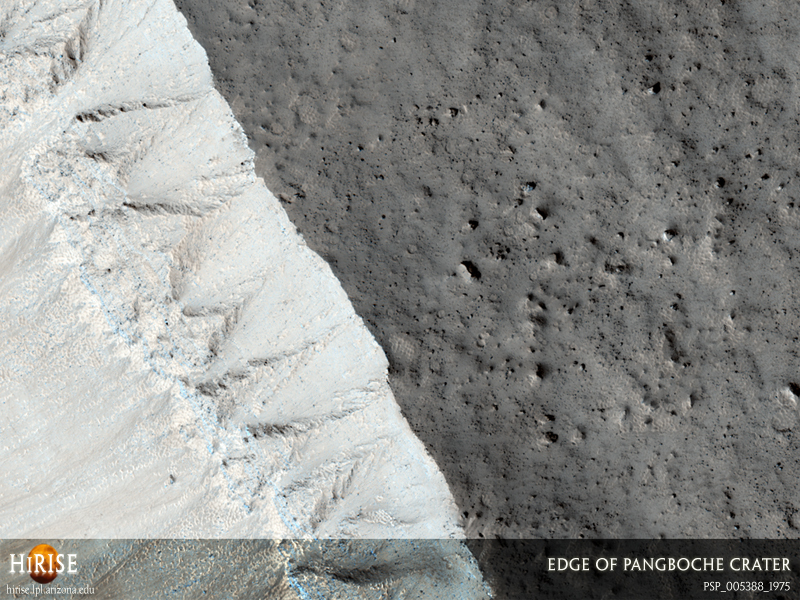 Over time, crater rims degrade and blend into their surroundings. It has steep walls as indicated by the numerous boulders rolling down the walls. For boulders and material to dislodge from a slope because of gravity alone, slopes need to be rather steep (approximately 30 degrees). The interior of the crater contains material that likely slumped off the walls during late stages of its formation. The north wall of the crater has material that has not slumped to the floor, instead forming a terrace. Also noteworthy is the abundance of small craters that surround, but do not occur within, Pangboche. 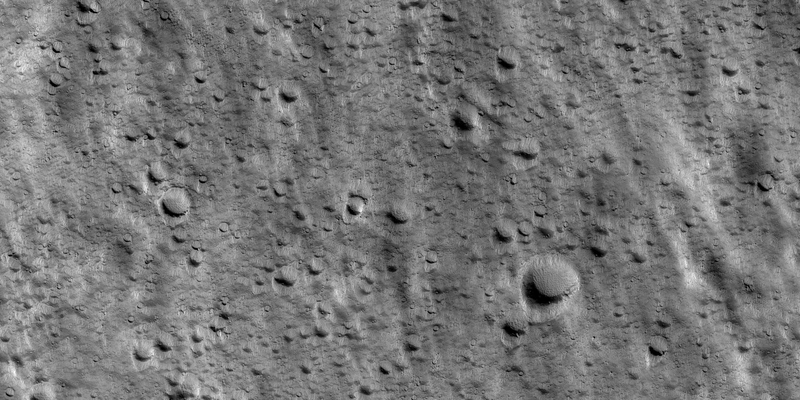 These are mostly secondary craters that formed when ejecta from an impact hit the surface. If the small craters were primary craters (formed from an impactor from space), then they would be expected to be within Pangboche as well. Secondaries commonly occur in clumps as seen here (see subimage, approximately 2 km across). The strong clustering indicates that these craters are secondaries. This is a stereo pair with PSP_005533_1975.